Please contact us, to take advantage of this special offer. Your dentist will check that your teeth are suitable for these treatment options, explain these "smile improvement" options to you and answer your questions. Please note treatments provided for cosmetic benefit only are not covered under the NHS. We can offer such treatment options outside NHS arrangements if you so decide. Your dentist will advise you of the fees beforehand so that you can make an informed decision. These new generation dentures are much lighter, than traditional dentures and with a degree of flexibility offer increased patient comfort and adaptability. They are also aesthetically superior, with no metal clasps and translucent acrylic which comes in different shades to match your natural gum tissue. Some patients prefer tooth-coloured fillings over traditional amalgam fillings, mainly for cosmetic reasons A small number of patients, however are concerned about the safety of amalgam fillings. Please note that the Medicines and Healthcare Products Regulatory Agency (MHRA) supports the continued use of amalgam fillings. It states "The safety of dental amalgams has been reviewed extensively over the past 10 years, both nationally and internationally, concluding that dental amalgam is safe to use." A crown is a "cap" that is made to fit over a prepared tooth surface and is designed to protect and strengthen the tooth, as well as provide long-lasting comfort. 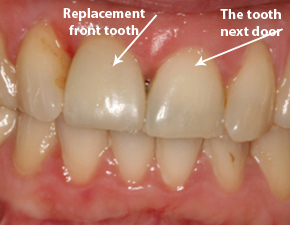 "Over time, metal restorations can leave a dark ridge where the gums recede". "With 3M ESPE Lava™ Zirconia, your restoration retains its original beauty for years". Tooth whitening can be a highly effective, yet very simple way, of lightening the colour of teeth without removing any of the tooth surface. Your dentist will check that your teeth are suitable for teeth whitening, explain the treatments available and answer your questions. Implants have been used for some time now and with the advances in technology and techniques, they are gaining in popularity as the modern way to replace almost any missing tooth/teeth. The Implant is placed into the bone and allowed to heal. 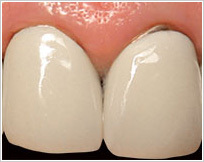 A small attachment is then added to the implant to which a crown can be fixed. Your '3rd' set of teeth are intended to look natural, give you more comfort and to last for many years. 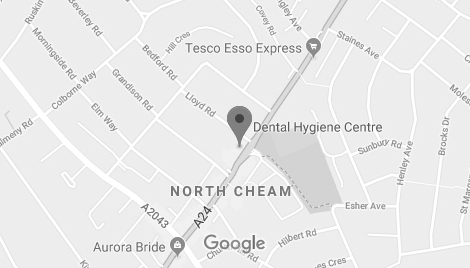 You can arrange, at Dental Hygiene Centre, for an examination with the specialist, Dr Oliver Quinn. For this examination, the fee is £125 which includes a full-mouth assessment, including any routine x-rays. A detailed treatment plan report, which explains the stages of treatment and the treatment fees, is also provided. Dental Hygiene Centre patient : "I had an implant fitted, which is amazing. The colour match is perfect. You cannot tell that it isn't a real tooth. Now I have my confidence back in myself and my smile. Thank you so much, it was worth every penny." crown(s) placed on supporting teeth. 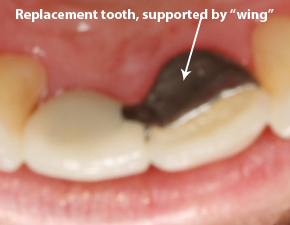 Alternatively adhesive bridges simply use a "wing" bonded to the adjacent tooth and involves minimal tooth preparation. Patient comments: "I've been so pleased with this bridge. I was wearing a plate before and it used to fall out sometimes when I was eating. Since Dr Jetha made me the bridge, it feels like I've got my own tooth back and everyone I meet, including dentists!, tell me how natural it looks." A veneer is a thin layer of ceramic made to fit over the front surface of a tooth, like a false fingernail fits over a nail. Sometimes a natural colour 'composite' material is used instead of ceramic. 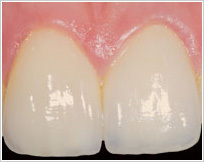 Dental Hygiene Centre patient : "I am so pleased with my new smile, the results were very quick. I would highly recommend the Inman Aligner. After this treatment, I've walked away feeling very confident with my new smile." A proven approach to straightening your front teeth is the Inman Aligner. Improve your smile in a matter of weeks.